Stewart Cemetery is located in a woods at the south east corner of the intersection of Division Road & 500 W on 1 acre of land once owned by Stephen and Amy Stewart. 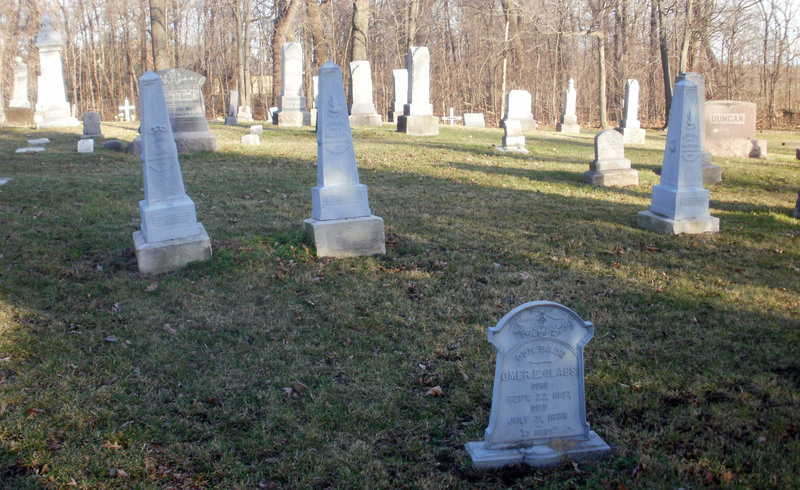 The cemetery was originally used by the Stewart family and their neighbors. Later, in 1868 they deeded the land to the Tipton Co. Commissioners for the purpose of a public burying ground . In the last few years it has again become an active cemetery. Gae & I were surprised and excited to find four “White Bronze” markers in this cemetery (OK, that is just weird). They can be seen in the photo above. "White Bronze" markers are actually made from zinc. The name was a marketing ploy to make the material sound more attractive. The markers were produced by the Monumental Bronze Company, Bridgeport, Connecticut and sold nationwide from the 1870's to 1914. They consist of bolt together panels and are hollow. The panels could be updated or replaced as late as 1939. The markers were sold with the claim that they were "modern" and "progressive". They also cost about 1/3 less than stone and were easily shipped. There are stories told of how caretakers tipped up large family markers and used them as tool sheds. Outlaws sometimes hide their loot inside of them. Yes, Gae and I have already checked.